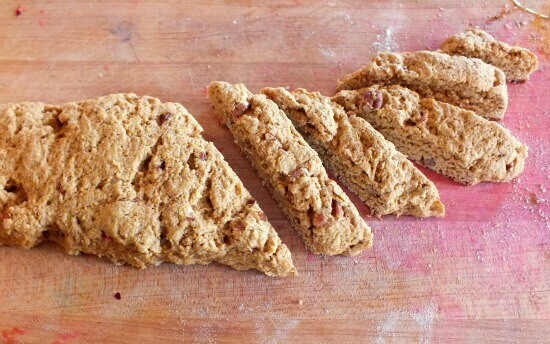 How did Bourbon Pumpkin Pie Biscotti come about? Well, a few weeks ago SheSpeaks and Torani Syrup offered me the opportunity to try out a couple of syrups in my holiday baking and brewing. I have used the syrups in the past – we love Italian sodas around here – so I was happy to accept. Torani has been around since the 1920s, helping baristas and everyone else create flavored coffees and other beverages. You don’t see a lot of people using the syrups in baking recipes though, and there is where you miss out. Instead of just adding vanilla or almond to baked goods you have an entire array of over 100 flavors – and, unless they are sugar free, they are made with pure cane sugar. You know – just to get that holiday spirit rolling. Dang. These are awesome. They are easy to make, the house smells amazing, and they travel well for shipping. I love to sit down in the afternoon and take a break with a cup of coffee or tea and a biscotti to dunk in it. 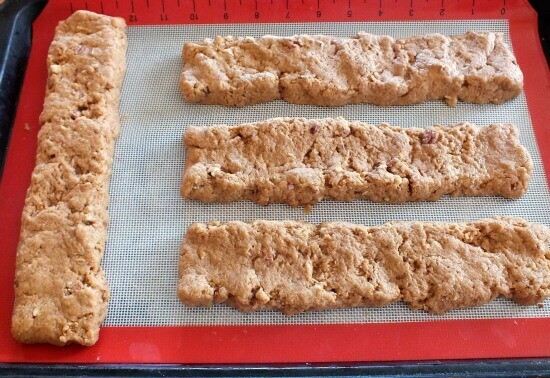 Shape the dough into flattened rectangles about two inches wide and ten inches long before baking. You are going to bake them in this shape first. After 20 minutes or so you will take them out of the oven and let them rest for 15 minutes. Once they have cooled for the 15 minutes you will slice them on an angle using a sharp knife. Arrange them back on the cookie sheet and bake them again. Not even your favorite coffee shop can beat that! Yummmm…. Disclaimer: Two Torani syrups were provided to me at no cost by SheSpeaks and Torani. My opinions of the product are unbiased and my own. I love Torani syrups! 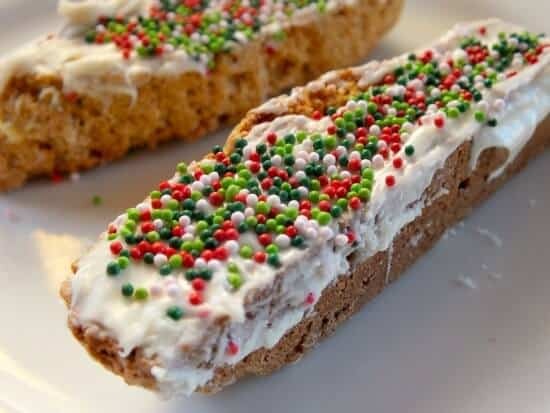 This biscotti looks dynamite! Me too! It is delish! What a great recipe! 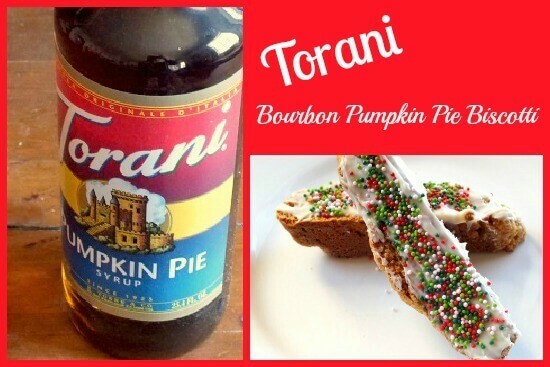 I love biscotti and bourbon pumpkin pie flavor sounds amazing! 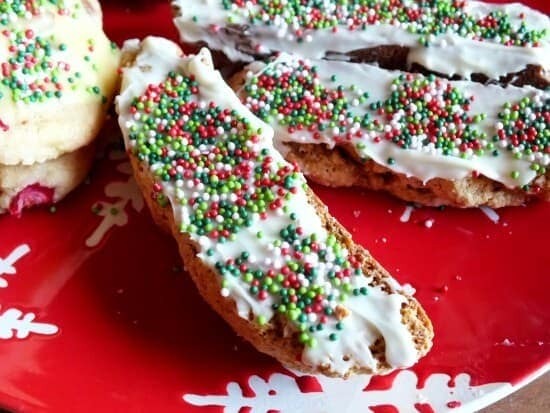 I love biscotti, sprinkles, and pumpkin — I am totally making these cookies! They are awesome as gifts! This would be such a great gift for the holidays, yum! Yep they are. They take a little time but they’re easy!